Passenger traffic at Dubai’s main airport climbed 6.1 percent in July from a year earlier, despite a seasonal slowdown in local traffic, airport authorities said on Wednesday. 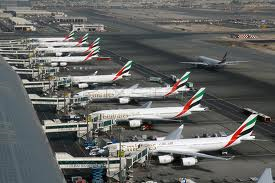 Dubai International, one of the world’s busiest airports, handled 5.31 million passengers in July compared with 5.01 million in the corresponding period of 2012, Dubai Airports said in a statement. Traffic in the first seven months of the year was up 15.3 percent to 37.97 million passengers. All regions recorded positive growth in Dubai traffic during July with the exception of the Middle East and Gulf, which dropped 12.6 percent and 8.0 percent respectively as Ramadan, the Muslim month of fasting, coincided with a summer slowdown. Passengers from Western Europe increased 13.4 percent, as that region replaced India as the top source of traffic. Freight volume through the airport declined 2.5 percent during July to 217,870 tonnes; volume in the first seven months climbed 8.1 percent to 1.52 million tonnes.